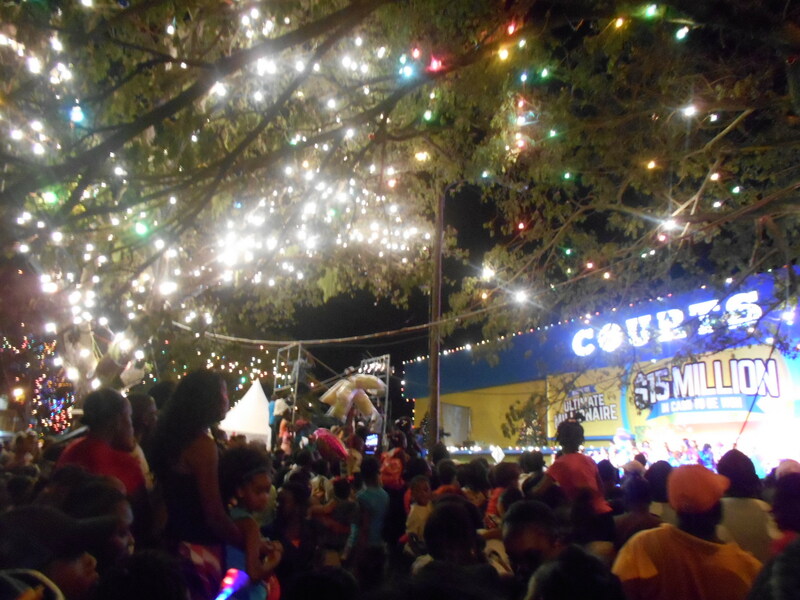 Last night, one of the large department stores in Georgetown had a lighting ceremony to kick off the Christmas season. There were thousands of people packed in the streets and the thin park outside of the store. Two local radio DJs, who I hear on the radio quite frequently, hosted the event. I thought they were relatively entertaining, but they had to do some hard-core advertising for the sponsoring store. What I noticed from the crowd; however, is that they were very forgiving of all of the plugs. The Guyanese find even the simplest of jokes hilarious, which I think is endearing, but as an American, I grew tired of hearing about all of the sales. Nevertheless, it was a very entertaining evening. The little group I was with was crammed in shoulder-to-shoulder with the rest of the crowd and the lineup of performers was entertaining. There were probably about eight or nine groups of dancers, singers, and performers leading up to the lighting of the park. There was a trio of singers who were brothers that called themselves “Y3K”, a group of young girls dressed like Christmas trees dancing from the National Dance Academy, a black Santa Claus and a white Santa Claus having a dance-off, and there was even a comedian. 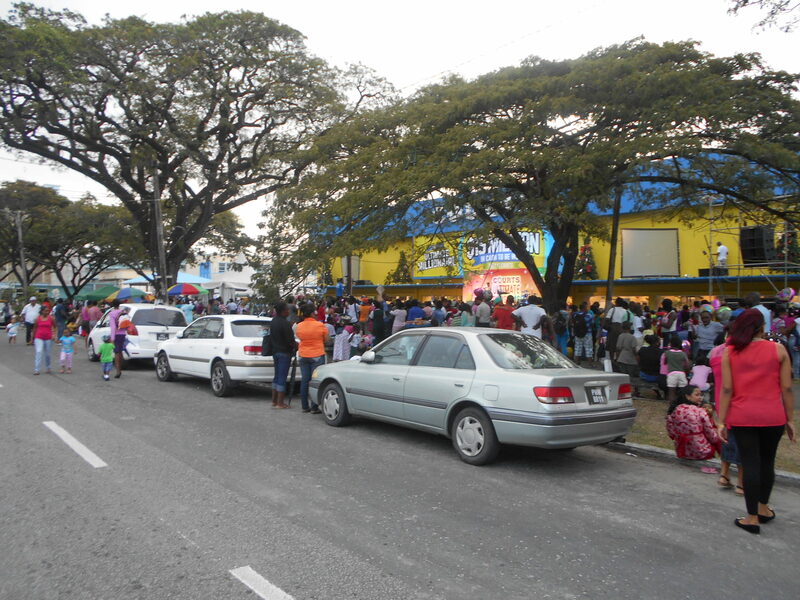 Since the Guyanese love their jokes, the comedian went over really well. One of my roommates pointed out that the crowd was acting like a laugh track. Every time the comedian paused after making a joke, everyone would laugh for just the right amount of time, at just the right volume. Somewhere between the heavy accent and the difference in culture, most of the jokes were lost on my, but I found it entertaining simply that she was amusing the crowd. There was, unfortunately, one very awkward moment for us during the evening when the comedian decided to crack a joke about white people. Normally, at large events like this one, there are at least a few other white people, but I didn’t see anyone other than my group at this event. As soon as the comedian started to make the joke, people from the crowd immediately started looking at us. I didn’t know where to look or what to do. Look at the other white people around me? Keep staring at the stage like it didn’t matter to me? Act like it’s funny with the rest of the crowd? I was thankful that the joke didn’t last more than a minute. Again, it was hard to understand, but the joke went something like this: “all white people do to decorate is hang up balloons, and they don’t even call them balloons, they call them blubber.” It made no sense to me, but the crowd thought it was funny. The evening lasted about two hours. By the time we got around to lighting up the park, I was ready to be finished standing. The hosts of the event had the crowd count down from ten, and then all of the lights came on. I hadn’t realized how dark it was before the lights came on. There were large Christmas lights strung up on the trees above us, on the Christmas trees on top of the store in front of us and on the stage, and all around the outside of the store. It shed some light on the very thick crowd around us. Then, Santa Claus came riding in on top of a float. He was accompanied by the worst looking Spider-Man, Mickey Mouse, Minnie Mouse, Spongebob, and Dora the Explorer costumes I have ever seen. There was also a Bert costume, but no Ernie; I thought that was pretty comical. It was an awkward arrival of Santa Claus, however. He was carrying a fire extinguisher and kept spraying it a little at a time in a rather provocative way—it was odd, awkward. Before the lights came on (about 5pm). Santa with Spiderman on his float. 1. 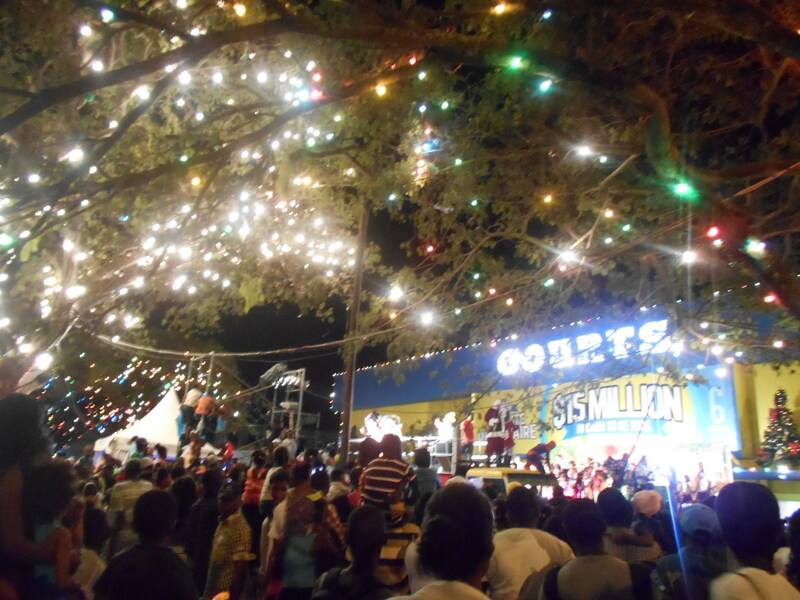 The Guyanese like to add a little pizzazz to every Christmas carol they sing. 2. Black Cake and Pepper Pot are the two Christmas foods I keep hearing about—I’ll have to sample. 3. If I spend just $5,000 (about $25 U.S. dollars) at COURTS this holiday season, I could be in the running to win $2,000,000! 4. An over-sexual Santa Claus goes right over children’s heads and parents seem to find it amusing. 5. Being the only white person in a crowd of people laughing at white people is completely awkward.